ScotRail said a landslip between Stirling and Dunblane had closed the rail line. There were also rain warnings in place for southern Scotland, the Western Isles and the Northern Isles. Network Rail said lines between Stirling and Dunblane had been blocked by the landslip and trains were currently unable to run. A spokesman said: 'The 14:39 from Aberdeen to Glasgow Queen Street is currently unable to move near Stirling because of the landslip. Due to extensive flooding, it also can't move back towards Perth. Staff and police are currently trying to get to the train.' 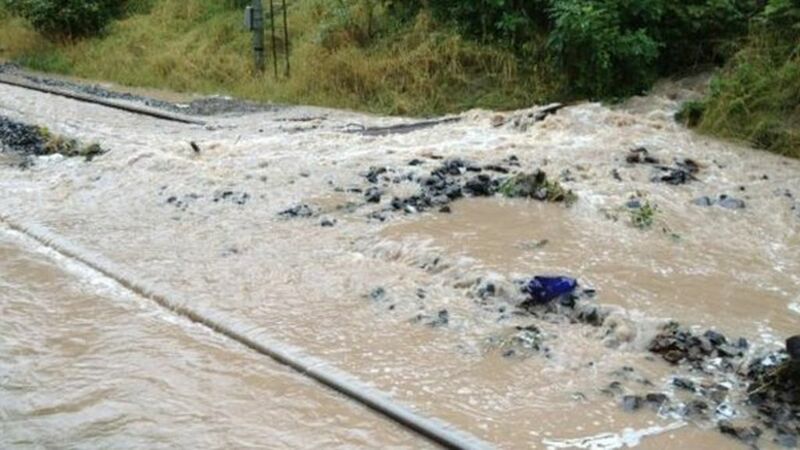 The line between Carstairs and Motherwell has also been affected by flood water, causing delays on the route. Engineering works take place through the night to clear landslip damage to the rail line between Stirling and Dunblane.